1918 The independent African-American filmmaker Oscar Micheaux formed the Micheaux Film and Book Corporation. His first feature film were released the following year, The Homesteader (1919) - a lost film. 1918 The four Warner brothers, Jack, Albert, Harry and Samuel, opened their first West Coast studio. 1918 Roscoe "Fatty" Arbuckle was lured in 1918 by the first multi-year, multi-million dollar a year deal to make six-feature films within three years with Paramount. 1918 Charlie Chaplin was the first actor to have a million dollar contract, with First National Pictures, Inc.
1918 The first Tarzan film, director Scott Sidney's black and white Tarzan of the Apes (1918), premiered at the Broadway Theater in New York, with the first actor to portray Edgar Rice Burroughs' 'Lord of the Jungle', Elmo Lincoln, as an adult. [Elmo Lincoln was a former Arkansas police officer, who had also appeared in several D.W. Griffith films.] Technically, the 'first' Tarzan, a 10-year old youthful Tarzan in the same film, was portrayed by Gordon Griffith. It was the first film adaptation with the Tarzan character, based on Edgar Rice Burroughs' original novel Tarzan of the Apes about the jungle lord. 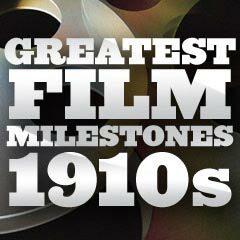 The milestone film was one of the first films to earn over a million dollars. 1918 The US Supreme Court had ordered the Motion Picture Patents Company (MPPC), known as the "Edison Trust," to disband or dissolve, and it was officially terminated. Soon after, the Edison Company abandoned the film industry. 1918 Early cartoonist and animator Winsor McCay's 12-minute propagandistic, documentary-style The Sinking of the Lusitania, an animation landmark, was the first serious re-enactment of an historical event - the torpedoing of the RMS Lusitania by a German U-boat on May 7, 1915, resulting in the loss of almost 2,000 passengers. It was one of the earliest films to utilize cel animation. 1918 The first full-length Technicolor film produced in the US was The Gulf Between (1918). It used Technicolor Process Number One, but only a few frames of this lost film exist today. 1918 Though the silent film Cupid Angling (1918) was advertised as the first color feature-length film (using the Douglass Natural color process) ("the first photoplay made in natural colors"), both Kinemacolor and Technicolor had produced prior feature films in color.